PHILADELPHIA -- Tim Tebow worked out Monday for the Philadelphia Eagles, two people familiar with the session told The Associated Press. Both people spoke on condition of anonymity because the workout was not made public. One of the sources said Tebow worked out at quarterback and left the facility without discussing a contract. Considering all the offseason moves made by coach Chip Kelly, taking a look at the 2007 Heisman Trophy winner with the huge following shouldn't be a surprise. Tebow could run zone-read plays better than Philadelphia's four current quarterbacks. Tebow has not been on an NFL team since the 2012 season. He was released by the Jets, then attended training camp in the summer of 2013 with the Patriots, who cut him. One of the most successful college quarterbacks at Florida, Tebow started 14 games for Denver over two years after being selected in the first round of the 2010 draft. He threw for 316 yards in a playoff win with the Broncos, who traded him for fourth-round pick when they signed Peyton Manning. 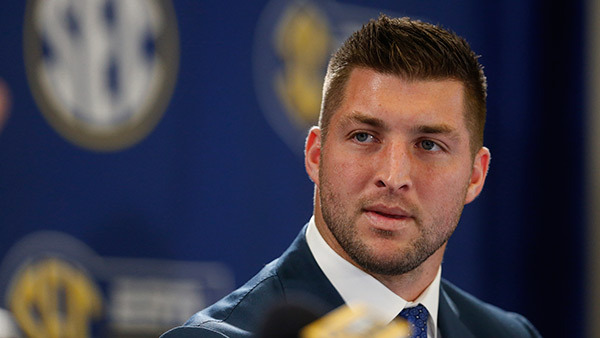 Tebow has been working in television as an analyst for the SEC Network and ESPN. Kelly recently traded starting quarterback Nick Foles to St. Louis for Sam Bradford. His backup is Mark Sanchez, who was the starter for the Jets when Tebow was there. That was a highly uncomfortable situation for Sanchez. Matt Barkley and G.J. Kinne are also on the roster. Kelly's remake of the Eagles' roster has included trading star running back LeSean McCoy to Buffalo, then signing Offensive Player of the Year DeMarco Murray to replace him. Clearly, Kelly - who took over personnel duties after last season - is unafraid to look anywhere for possible upgrades. Although Tebow had some success in Denver, his inaccurate passing and lack of pocket presence has plagued him in the NFL. His strength has been running the ball or improvising. There's also been some thought that Tebow might switch to tight end or fullback, although he has balked at such a move in the past. The Eagles have depth at tight end, but no fullbacks on the roster. Kelly likes versatile players, though Tebow tried out at QB.